Dale came away pointless from a game that looked like theirs for the taking. It was however “heartbreak hotel” time as Hinckley grabbed the lead with an interception try to take the lead and a last-minute penalty denied Dale even a losing bonus point. To quote Hinckley’s chairman ‘you were robbed’. It was a game that Dale could have, may be, should have, won. Both sides were unbeaten coming into the game and the match was a close encounter. Hinckley took the lead with a converted try. Hinckley gathered a clearance from Dale and quickly moved the ball left and an overlap allowed Hough to cross the line. Joe Wilson added the conversion. Dale answered after a nice move from the backs and an inside pass from Ben Parkinson saw Rhys Lovegrove score. Tom Mann converted and then kicked a penalty to take the lead. Rian Hamilton extended the lead with an interception and a 65 metre run to the line for a converted score. Hinckley responded with a penalty and on the stroke of half time their own interception try, with Wheatcroft touching down, to tie the scores at half time 17-17. Hinckley notched up two penalties from Wilson’s boot, before Will Bell scored from a fantastic effort by the forwards. Mann’s conversion gave Dale a one-point lead. At this point the Hinckley support seemed to have accepted defeat and Dale could have extended their lead with an extended period of time in Hinckley’s 22. Hinckley then stole the game with a converted interception try with Wilson adding to his points tally with the score and conversion. Dale still had chances. A catch and drive from an attacking 5 metre line-out went uncontested and Dale kept the ball at the front and walked towards the line. The referee was convinced that the ball had been transferred and stopped Dale’s march and awarded a scrum to Hinckley. Dale were then guilty of back chat and the penalty was awarded and Hinckley escaped. Two more penalties took Hinckley deep into Wharfedale territory and, with the last play of the game, a successful penalty kick from close range by Wilson, meant that Dale came back pointless. But a superb match, the Greens were magnificent in defeat and with seven changes from the team that beat Sedgley Park it shows that Dale have strength in depth. Sam Gaudie and Will Bell worked well as half backs. This was the first time the pair had played together and the combination kept Hinckley guessing and varied Dale’s play. Bell’s kicking to the touch line was generally superb including one 50 metre effort from a tight angle. Dale’s scrum was under pressure early on and it was George Martin who stepped in and steadied the ship. Yellow Cards were handed out with both sides getting 2 each during the game. 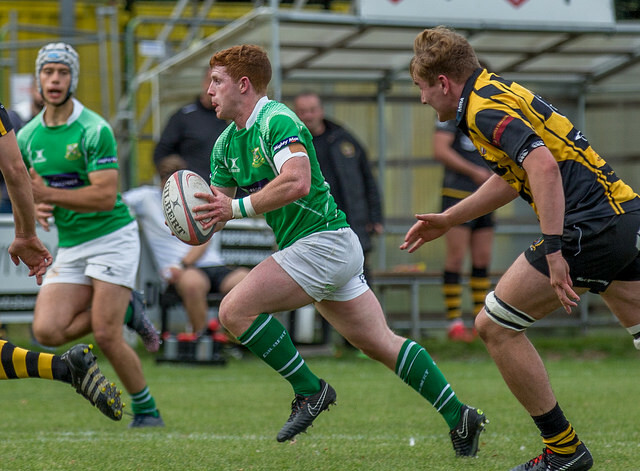 This was the same with interception tries – it looked like being a friendly one a piece until the end when Hinckley made the most of Wharfedale’s BOGOF offer. Back to the training ground and a good look at the mistakes made, most notably the two interception tries. They were not like last year when Dale threw long passes that were easily picked off. These were close quarter interceptions and simpler. The penalty count needs to be addressed with Hinckley’s 12 points from the tee condemning Wharfedale to returning up the M1 without a point. Wharfedale: – Mann, Cicognini, Parkinson, Lovegrove, Hamilton, Bell, Gaudie, Booker, Stockdale, Ward, Leacock, Hedgley, Tyson, Walker, Burridge. Replacements: – Martin, Jackson, Baldwin, McNab, Prell.